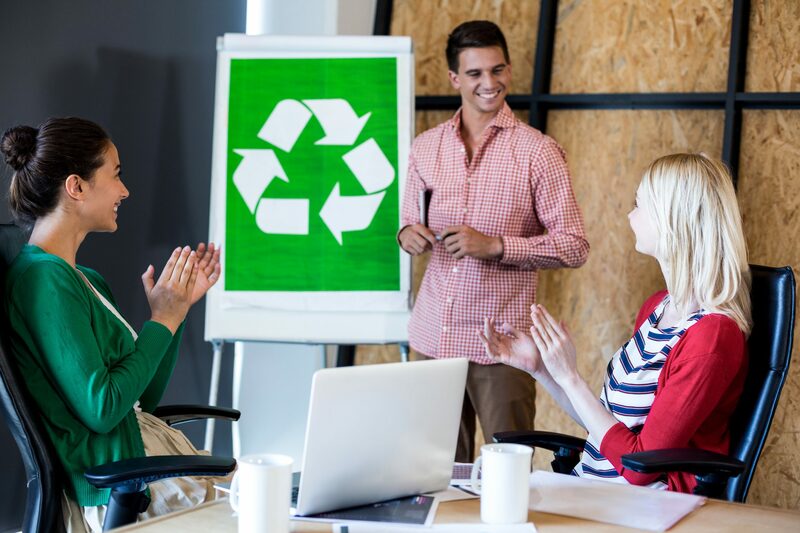 Why Reduce Waste in Your Workplace? On average, Americans spend one-third of their day at work. According to U.S. EPA, the average American office worker uses 10,000 sheets of copy paper each year. That’s four million tons of copy paper used annually! We should be making environmentally conscious decisions at the office just like we do at home. Athens Services recommends the following 10 tips to help reduce waste at your workplace while saving resources, money, and the environment. Put together a group of employees responsible for designing a sustainability program. Their tasks should include: goal setting, planning, implementation, company wide education and compliance. 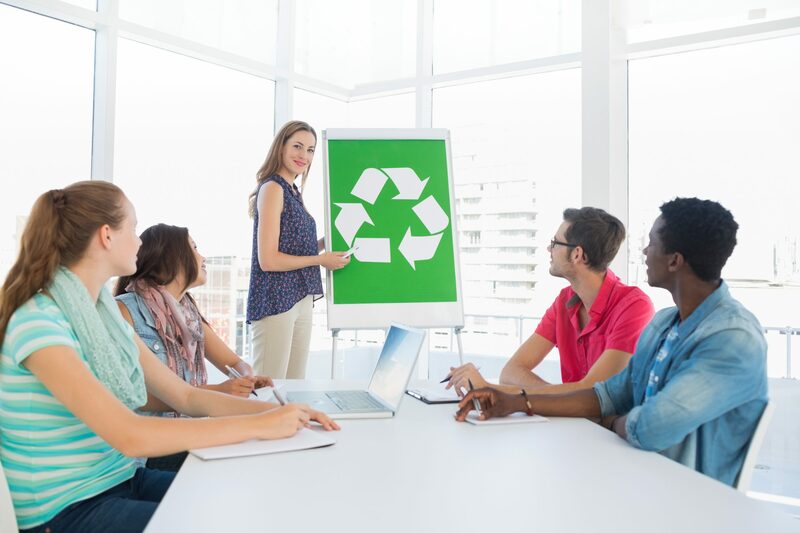 Develop a policy that gives purchasing preference to eco-friendly, non-toxic, and recycled content products. Create friendly competition and incentivize employees or departments to set and achieve goals. Create a recognition program, which could include rewards and/or acknowledgment in company publications. Buy inexpensive and recyclable servingware for the office, or require people to bring in their own. You will save money, as well as energy and water used in the creation of a new product. Another good idea is to provide employees with branded water bottles and mugs to encourage reuse. According to the County of Hawaii Department of Environmental Management, Americans throw away 138 billion straws and stirrers a year. Minimize one-time-use disposables by replacing foam coffee cups and stir sticks with reusable options and buying coffee and condiments in bulk versus non-recyclable individual packets or pods. The U.S. EPA estimates that 90% of all office waste is paper. Print only when necessary and always double sided. Use at least 30% recycled content paper, keep a “scrap box” near the printer, and invest in desk size whiteboards for jotting down notes. Conduct paperless meetings; use presentations and email copies of handouts in advance. Keep track of supplies and avoid over-purchasing. Have one central location for supplies. Encourage colleagues to share common desk items (like a stapler) versus buying one for each desk. Create a day where employees go through their supplies and get rid of unused items. Extras can be donated or placed in the supply room. Give away reusable and repairable items instead of throwing them away. Nonprofit groups and art programs are often in need of items like electronics, office supplies, office equipment, fabrics and vehicles. Start a food waste collection program at work. For more information go to the Food Waste Recycling section of our website. Consider donating leftover, unspoiled food from events and meetings to local food banks or rescue programs. For information on locations, resources and the “Good Samaritan Law” visit the U.S. EPA website.